The Production Run: Introduced in 1980 and discontinued almost 21 years later, the Nikon F3 was the third in a series of pro-line flagship Nikon SLR's that now numbers six cameras. It was preceded by the various models of the F and F2, and followed by the F4, F5, and F6. As this is written, some New Old Stock F3's are starting to command prices approaching those associated with the F5. Less pristine examples of the F3, especially early ones, cost much less, and represent one of the great bargains in manual SLR photography. 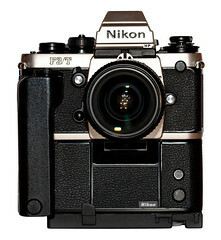 Initial Resistance: The F3 was initially resisted by Nikon traditionalists who were slow to trust the battery dependence of its superb microelectronics. When the batteries in the meter of an F or F2 died, the camera itself was not affected. When the batteries in an F3 die, though the film can still be advanced, the photographer is limited to a single mechanical shutter speed of approximately 1/60 second. It is tripped by a secondary fully mechanical shutter release. Of course, batteries are cheap, and this problem was more theoretical than practical. Eventually even many diehard F and F2 fans adopted the F3 in spite of its battery dependence. Users found it hard to resist the camera's sleek appearance, aperture priority exposure automation, TTL-flash capabilities, ball-bearing shutter advance, quartz-timed shutter, mirror lock-up, and rugged durability. The first Nikkor SLR lenses had fully automatic diaphragms, and a prong was affixed to the aperture selection ring that engaged the metering system of the camera on which it was mounted. When the lens was mounted properly the camera could meter at full aperture, but the lens/camera combination had to be manually indexed to the maximum aperture of the lens in use. 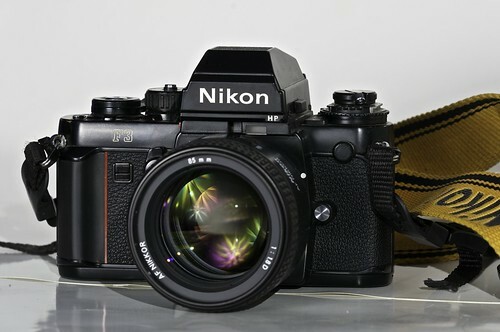 Near the end of the F2 era, c. 1977, Nikon introduced the AI or "Automatic Indexing" cameras and lenses. AI lenses had a small tab on the aperture ring that engaged the meter on the camera body. No further indexing was necessary. The metering prong was preserved for use with Non-AI camera bodies. At the same time Nikon offered a service for converting older Non-AI lenses to AI specifications. Usually, new aperture selection rings with AI tabs were mounted, enabling even the oldest Nikkors to be used like AI lenses. Today, though AI conversion is no longer available from Nikon, it is available from a number of repair shops. Though new old stock kits sometimes show up on eBay, the conversion is usually accomplished by modifying the existing aperture selection ring. In the early 1980's Nikon introduced their final major manual lens alteration, the AIS series. These lenses are AI lenses with several key differences. In the context of this review it is sufficient to note that AIS lenses added a small semi-circular notch in the base that enabled cameras like the FA and F4 to identify the focal length of the lens that was in use. This enabled the camera to set minimum shutter speed to guard against camera shake when selecting the shutter speed/aperture combination in Program Mode. On most Nikon cameras other than the F4 and FA there is no advantage to mounting AIS lenses instead of AI lenses. AIS lenses also preserved the trademark Nikon metering prong so that they could be used on older bodies. Precise Frame Coverage: Like all the top-line F cameras that either preceded or followed, the F3 features precise frame coverage, and the finder shows virtually 100% of the image that is recorded on the film. In 1982 Nikon introduction the High Eyepoint "HP" finder (DE-3), which allowed even eyeglass wearers a clear view of the entire frame. This HP style finder became standard on the F3, which became known as the F3HP, and on many Nikons to follow. Eyepiece Correction Lenses in diopters from +3 to -5 were available for standard eye level finders, and +2 to -3 for the HP finders. "No less than 50,000 special non-silvered spots at the center of the main mirror allow precisely 8% of the light to pass through. This light is then reflected off a "piggyback" secondary mirror down to the fast reacting SPD (Silicon Photo Diode) light sensor located at the bottom of the mirror box." In standard TTL operation, the ISO range of the F3's meter is from ISO 12 to ISO 6400, and the metering range is from EV 1 to EV18, approximately F1.4 at 1 full second to F11 at 1/2000 second with ISO 100 Film. Interchangeable Viewfinders: Because the meter was in the body, not the finder, the photographer enjoyed the use of the F3's TTL meter regardless of which viewfinder was mounted, whether eye-level (DE-2), eye-level HP (DE-3) waist-level (DW-3), sport (DA-2), or high-magnification (DW-4). A right-angle viewing attachment (DR-3) and an Eyepiece Magnifier (DG-2) were also available. Interchangeable Focusing Screens: The F3's five interchangeable viewfinders could be paired with 15 interchangeable focusing screens which were unique to the F3. There was a screen for almost every purpose from the standard central split-image rangefinder screen with surrounding microprism to screens designed specifically for architectural photography, astrophotography, and TV broadcast simulation. Accurate and Robust Shutter: The quartz-timed titanium shutter of the F3 is famous for its durability and accuracy. Tested for a duty cycle of 150,000 exposures, the F3's shutter extends from a high speed of 1/2000 second to a low speed of 8 seconds and beyond. The manual range includes the geometrically progressive scale in seconds and fractions of a second. The dial is marked in orange for 8 second, 4 second, 2 seconds, and 1 second. It is marked in white for all speeds in a fraction of a second including: 1/2, 1/4, 1/8, 1/15, 1/30, 1/125,1/250,1/500,1/1000, 1/2000. 1/60 of a second is marked in red, the top marked flash-sync speed, excepting X. At X the F3 shutter has an flash-sync of 1/80 of a second. T (time) and B (bulb) speeds are also available. A separate shutter release lever fires the body at either T or at a speed approximately around 1/60th of a second when the batteries are dead or the camera is turned off. Full Manual Operation: The F3's sophisticated TTL meter coupled to its electronic shutter allows the photographer to select between full manual and aperture preferred automatic exposure control. In manual operation the photographer selects both the shutter speed and the aperture manually. The aperture is read directly through the ADR (Aperture Direct Readout) window from the lens barrel of AI, AIS, and some converted and properly marked Non-AI lenses. This feature was carried over from the Nikon FTN Photomic and all metered models of the F2. A first for the F3 was an LCD readout showing the shutter speed. In manual mode, when a scene is underexposed, a - (minus) sign shows just to the left of the shutter speed, positioned over a small "M". When a scene is overexposed, a + (Plus) sign shows in similar fashion. When correct exposure is attained both + and - signs are visible, indicating correct exposure. Aperture Preferred Automation: When the F3 is set for aperture preferred automation, the photographer selects the aperture value, and the camera selects the appropriate shutter speed from a step-less range of rather more than 8 seconds on the low end to precisely 1/2000 second on the high end. Though the camera is capable of all intermediate shutter speeds when in A mode, unlike more modern Nikons, the shutter speed readout in the F3 is limited in what it can display. For example, though the camera may select 1/200 as the optimum speed for the selected aperture, the viewfinder's LCD will display the nearest standard speed, in this case, 1/250. Like most automated cameras worth their salt, the F3 also features an Exposure Memory Lock, allowing the photographer to meter the most important element of a scene, press and hold the EML, and retain the selected exposure in memory while recomposing the photograph. An Exposure Compensation Dial mounted on the top left of the camera under the rewind-crank and unique F3 flash mount, allows the photographer to program in a plus or minus 2 stops of exposure. It is marked in 1/2 stop increments. Meter quirk: Although Nikon no doubt considered it a feature, the meter of the F3 will not properly activate until the film counter has been wound forward to "1". It is intended as a defence against the user accidentally triggering a many-second exposure in auto-exposure mode while loading film - thus the meter remains off and the shutter fires at the mechanical speed of 1/80 until film is advanced to the first frame. This feature is not mentioned in the manual, but is the subject of much confusion and grief in the photography fora. TTL Flash Metering: The F3's sophisticated TTL flash metering measures the exposure off the film plane during the moment of exposure. It works within a limited film-speed range of ISO 100 to ISO 400. To take advantage of this, one needed a flash designed for the F3's flash mount. Though adapters like the AS-4 and AS-7 were available so that the photographer could mount flash units with ISO hot-shoe style mounts on an F3, units so mounted worked only in Manual or Non-TTL Auto modes. Nikon TTL units for the F3 included the SR-2 ring flash; the Nikon SB-17, an F3 version of the SB-15; and the SB-16A, a flash that featured an interchangeable foot that could be exchanged to mount the flash on either the F3 (AS-8) on cameras with more conventional hot-shoes (AS-9). A Newer ring-flash, the SB-21 was also made available in a version with special F3 TTL connections. All these flash units supported full TTL operation with the F3. Among the conventional units, the SB-17 was small and light, and the SB-16A was powerful and versatile. Both were capable of bounce flash, and off camera flash when used with the one meter TTL Remote Cord SC-14. Third-party makers like Sunpack also offered units for the F3. 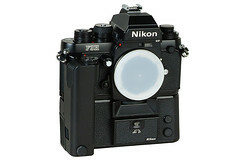 AS-17 TTL Flash Adapter: Near the end of its production run, Nikon engineers did what they should have done in 1980. They introduced a TTL hot-shoe adapter for the F3. The AS-17 enables the F3 to mount and meter Through The Lens with all Nikon flash units with the ISO hot-shoe style foot. The AS-17 even features exposure compensation in the F3's limited ISO flash range of 100-400. The photographer may simply resent the ISO setting on the flash-shoe itself, and there is an additional plus or minus 1/3 stop capability built into a separate switch on the AS-17. Gripes with Flash: If F3 owners have a gripe it is over the camera's flash capabilities, especially its slow flash-sync speed of 1/80 second or below, and the fact that the camera's non-Flash metering capabilities shut down the moment that a flash is switched on. There is a work-around for doing good fill-flash work on the F3. Meter the scene with the camera's built-in meter, and set the aperture and shutter-speed manually, being careful to set it below 1/60 or a second. At this point it is o.k. if the flash is mounted, as long as it is not switched on the meter will work. One may also select the 1/80 sync speed by selecting the X, but the conventional meter will not function at this speed. Once the exposure is set, adjust the Film Speed Compensation dial on the camera or on the AS-17 to the desired amount of compensation. Switch on the flash, and shoot the scene. This is not as cumbersome a procedure as it seems when the light source is reasonably constant. 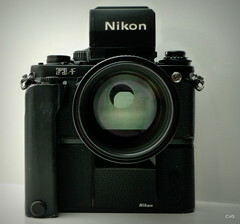 Of course, one could still wish that Nikon had given us an F3a to match the flash capabilities of the exciting new FM3a! Self-Timer and Easy Double Exposures: The F3 also features an electronic self-timer with a blinking LED warning light, and no camera is easier to use when one desires to make a double-exposure. The switch for the former is located on the base of the shutter speed dial, and the switch for the latter is located is just to the front of the rewind-lever. The MD-4 Motor Drive: The MD-4 adds to the versatility of the F3. Designed to give the camera what some have called perfect balance, especially when mounting long lenses, the MD-4 is ordinarily powered by 8 AA alkaline batteries. This is handy when the smaller S-76 or SR-44 silver-oxide batteries are not available. Mounting the MD-4 the camera can expose up to 140 rolls of 36 exposure film. When the MD-4 is mounted and switched-on, it powers all the functions of the camera. It is capable of Single-Frame (S) and Continuous (C) operation. When running in "C" mode the F3/MD-4 can fire a 36 exposure roll of film in 9 seconds (4 frames per second) with AA alkaline batteries. Use of the MN-2 NiCd Battery unit boosts the frame rate to 5.5 frames per second, or 6 frames per second with the mirror locked up. Power rewind with the NiCd Battery takes just 4.5 seconds for a 36 exposure roll. A High-Speed version of the F3/MD-4 combination was capable of faster speeds. A selector on the MD-4 allows the photographer to limit the number of exposures made in "C" mode. The MD-4 has a Lock (L) setting that turns off the motor and the camera. Of course, should the noise of the motor prove a distraction, the camera can be always be turned on independent of the MD-4. The MD-4 provides automatic rewind of exposed film. The MD-4 featured many accessories, including a 250 exposure magazine. Several of these features deserve special mention: 1) The AH-2 and AH-3 tripod adapter plates that enable the F3/MD-4 combination to be mounted on a tripod with the lens in line with the center axis of the tripod are indispensable. 2) The MD-4 is also capable of using a highly cold resistant MN-2 NiCd Battery unit which extends the operating range of the camera to -68 degrees Fahrenheit. 3) The MK-1 Firing Rate Converter. Provides the benefits of the AH-2 and AH3 tripod adapters, plus a vertical firing button with a collar that allows you to limit the firing rate, between 1 and 3 frames per second. Highly desirable and hard to find. The Nikkor Lens Range: The best reason to purchase an F3 is that it mounts the full range of Nikkor lenses from fish-eye and extreme wide-angle, to Perspective Control, wide-angle, normal, micro, portrait, zoom and extreme telephoto. The F3 can use virtually any Nikkor lens ever made. 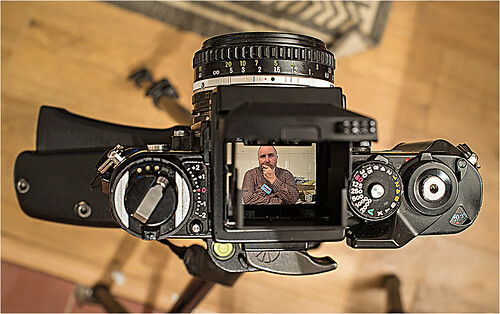 Aside from having to flip-up the meter coupling lever when the mounting a Non-AI lens, and then stop the lens down when metering, the one remaining caveat is that modern G lenses which lack an aperture-selector ring on the lens itself will function only in Aperture Preferred Auto-Exposure Mode. The camera will use only the widest aperture of the G lens, controlling the exposure strictly by the shutter speed its computer selects. Note: G lenses normally will stop down to their minimum aperture when mounted on a body that does not use electrical contacts. Exposure will not be accurate. Naturally, DX lenses designed with a smaller image circle for coverage on an APS sized digital sensor will give reduced frame coverage on the F3 or any other 35mm camera on which they can be mounted. Perspective Control lenses feature semi-automatic diaphragms which must be manipulated when metering. Some AIS lenses have achieved cult status, including the 28mm F2.8 AIS, the 24mm in several versions, the 55mm F2.8 AIS, and almost any 105mm 2.5, especially the AIS version with built-in hood. Several generations of Nikkor 80-200mm zooms are justly prized by their owners, as are Nikkor 20mm lenses of several generations. Other famous lenses that this author has not had an opportunity to try include the 180mm F2.8 lenses with ED glass. Accessories: Accessories for the F3 were available ad infinitum including data backs, bellows, copy stands, remote timers, cold weather gear, tele-converters, extension rings, and so on, and so on. Perhaps more significant to those used to modern wonder cameras, the F3 has a PC connection for flash, and it accepts a standard cable release. Special Editions: If one desires a more exotic model of the F3, the camera was also available as a titanium camera, the F3/T, in both champagne and black finishes. There is also a version called F3P (for Press or Professional), that was originally available just to professionals through Nikon Professional Services, but later available to the general public. The camera featured a non-TTL hot-shoe above the viewfinder, which had a titanium cover, B type focusing screen, no cable release socket, no self-timer, no eyepiece blind, special weather sealing, and a larger, easier to grasp shutter speed dial. Also came stock with the MF-6/6B back that left the film leader out when the MD-4 was used to rewind the film. Serial number starts out as "P 90xxxxx". A similar but rarer camera is the F3 Limited, sold mainly in Japan. Didn't come with the MF-6 back, and the B screen was missing the tab for removal. Serial number starts out as "L 95xxxxx" There were also special F3's made for the NASA, the United States Military, etc. An autofocus Model, the F3 AF, that used a special finder and a limited series of special autofocus lenses with the motor in the lens was available for a limited time. Though a landmark camera, it was not a world-beater. Last but not least, the F3 High Speed, marked F3H, could attain 13 frames per second and was equipped with a fixed pellicle mirror and a special version of the MD-4 motor called the MD-4H. Conclusion: The Nikon F3 is a modern classic. Those who use it find it a solidly made, superb handling, highly versatile tool for creative photography. Though no longer the first choice of NASA, 35mm wedding photographers, or photojournalists, it has taken on a second life as the quality camera that film loving hobbyists can actually afford. If the Nikon F2 is the SLR equivalent of a Leica M6, then the F3 can certainly be compared to the M7. The M7 is beyond the reach of most amateur photographers, the F3 is becoming more affordable almost every day, with users dipping down below the $200.00 range. Manual focus Nikkors are also very affordable. It is a great time for many of us to buy a camera that was once the absolute standard of the 35mm world. Those who love the F3 are not surprised that it outlasted the F4, retaining a spot in the Nikon catalog through much of the F5 era. The camera is so robust that many are likely to be in use as long as there is film to feed them. Nikon F3 Series: The Choice of Professionals. It was Copyright Nikon, Inc., 1985. The publication number is 8510.